This section includes articles, internet resources, photographs, research documents, and much more. This rich resource provides the eager learner with interesting background information to the Bible. This information focuses on the life and times of ancient biblical people groups, empires and cultures. Materials will include archaeological discoveries which enlightens us to the meaning of biblical passages, sociological studies which help us to understand what it was like living among common folk, on an average day, in ancient times as well as information on commerce and economics among the ancients; royal and common. Information about weather patterns and climate during those ancient days is also highlighted. Who could forget about politics, religion, and war? The triumvirate of true changes both good and bad are also explored. "We're dealing with really low-level soldiers in a remote place who can write," Finkelstein told Live Science. "So there must have been some sort of educational system in Judah at that time." Religious scholars have long fiercely debated when the Bible was written. Up until around the middle ages, people believed the Bible was written almost in real-time (as events were occurring). Text in the Bible mentions scribes and literate officials for the kingdom of Judah, which remained a state from roughly the 10th century B.C. to 586 B.C., when the Babylonian king Nebuchadnezzar laid waste to Jerusalem, destroyed the temple and forced most of the Jewish elites into exile in Babylonia. So scholars assumed the text must have been written prior to the destruction of the temple. But that line of reasoning assumed the biblical accounts were historically accurate. Another possibility is that those details about literate people were anachronisms inserted by later writers based on their own cultures, Finkelstein said. In recent years, one camp of scholars has pushed for a later date for the compilation of the Old Testament, with some even arguing the compilation occurred centuries later, when the Greeks or Persians ruled in what is now Israel, Finkelstein said. He said he and his colleagues realized there might be a different way to address the question. 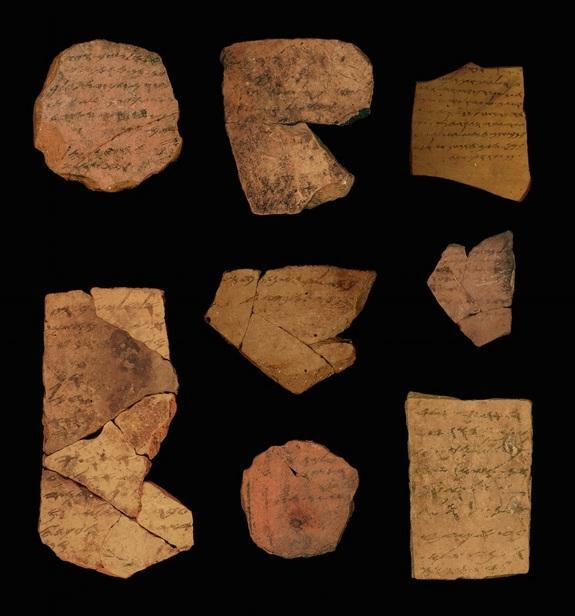 Decades earlier, archaeologists had uncovered archaic Hebrew ink inscriptions on ostraca, or pottery shards, from a frontier fort called Arad, a remote garrison located far away from Judah's central city, Jerusalem. 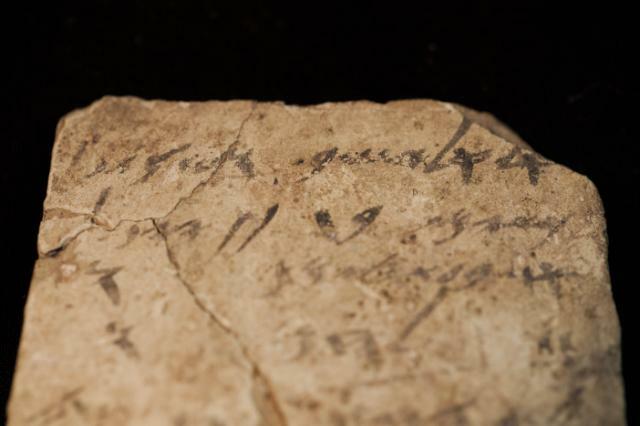 Finkelstein said he wondered whether these inscriptions, which were written over the span of a few months in 600 B.C., could reveal how many people could read and write at the time. To answer that question, Arie Shaus, a mathematics and archaeology doctoral candidate at Tel Aviv University, along with Shira Faigenbaum-Golovin, an applied mathematics doctoral candidate at the university, and colleagues, relied on machine learning. They used computer programs to scan digital images of the text, systematically fill in missing lines of text and analyze each stroke. Finally, the computer algorithms compared the script on each of the 18 inscriptions to see whether they were written by the same hand. (The ancient Hebrew text was written in an Iron Age script that is no longer used. All told, at least six different people wrote or read the script on the ostracas, including individuals ranging in rank from the commander of the fort, a man named Malkiyahu, all the way down to the deputy quartermaster, a soldier with a low rank, below the person running the fort's storage depots, the researchers reported today (April 11) in the journal Proceedings of the National Academy of Sciences. While none of these inscriptions were Shakespeare, most were written with proper spelling and syntax, the researchers found. "This is really quite amazing," Finkelstein said, "that in a remote place like this, there was more than one person, several people, who could write." What's more, other border forts have similar ostraca, suggesting that writing at that time was widespread, at least within the Judahite army, the researchers reported. Other archaeological evidence suggests that no more than 100,000 people lived in Judah at the time. Together, these lines of evidence suggest that a substantial fraction of the population (possibly several hundreds of people) could read and write, Finkelstein said. In order for so many low-ranking soldiers to be able to read and write, there must have been some kind of Judahite educational system, Finkelstein said. That, in turn, suggests there were enough literate people at that time to compile some portions of the Old Testament, such as the Book of Deuteronomy, parts of Genesis, and the books of Joshua to 2 Kings, Finkelstein said. By contrast, after the destruction of the first temple, when Israel's educated people were either killed or exiled to Babylonia, there is not so much as a pottery shard, seal or stamp with a single piece of writing from the region for more than 200 years, Finkelstein said. This suggests it's much less likely these books were compiled after the temple's destruction, he said. "In fact, I have argued in print that the literacy of elites (scribes, high governmental and religious officials) is already present by circa 800 [B.C.]" Rollston told Live Science in an email. However, not everyone agrees with all of the paper's assumptions. While the notion that many could read and write in the Kingdom of Judah during the seventh century B.C. is widespread, "I do not share the authors' opinion that literacy among the elite declined after the seventh century [B.C. ]," said Ernst Axel Knauf, a theology scholar at Bern University in Switzerland, who was not involved in the study. 1. The English word Bible is derived from the Koine Greek τὰ βιβλία (ta biblia - "the books"). While Christian use of the term can be traced to around A.D. 223, the late biblical scholar F.F. Bruce noted that Chrysostom in his Homilies on Matthew (between A.D. 386 and 388) appears to be the first writer to use the Greek phrase ta biblia to describe both the Old and New Testaments together. 2. The word "testament" (Hebrew berîth, Greek diatheke), means "covenant." The term "Old Testament" refers to the covenant which God entered into with Abraham and the people of Israel, and "New Testament" to the covenant God has entered into with believers through Christ. 4. The first complete Bible printed in the Western Hemisphere was not in English or other Europeans languages. The "Eliot Indian Bible," published in Cambridge, Massachusetts, between 1660 and 1663, was a translation in the Natick dialect of the Algonquin tribe of indigenous Americans. There were no English language Bibles printed in America until the late 1700's, mainly because they were more cheaply and easily imported from England up until the embargo of the Revolutionary War. 5. The first red-letter New Testament (i.e., words of Christ printed in red) was published in 1899, and the first red-letter Bible followed two years later. The idea of printing the words of Christ in red originated with Lous Klopsch, editor of Christian Herald magazine, who got the idea after reading Jesus' words, "This cup is the new covenant in my blood, which is poured out for you" (Luke 22:20). 6. The Bible is not only the best-selling book of all-time, it is consistently the best-selling book of the the year, every year. (Even in 1907, the New York Times noted that the "daily sales of the Bible, 40,000 copies, exceed the annual sales of most popular novels.") Currently, an estimated 25 million copies are sold or distributed in the U.S. every year, approximately one new Bible for every 12 Americans. 7. 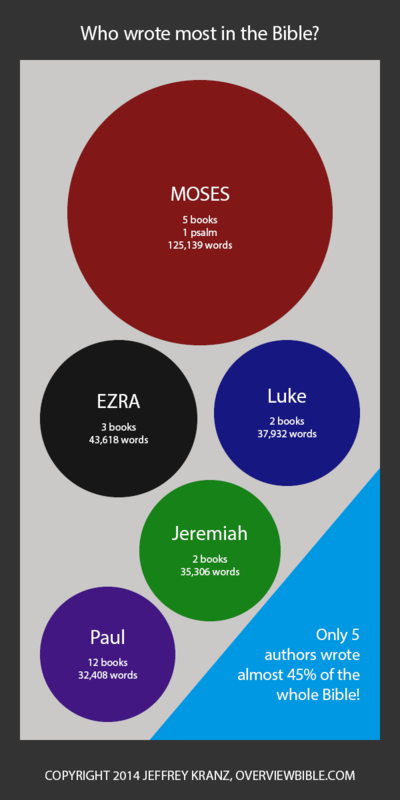 According to the Christian Booksellers Association, the most popular versions (ranked based on dollar sales) are: (1) New International Version, (2) King James Version, (3) New Living Translation, (4) New King James Version, (5) English Standard Version, (6) Common English Bible, (7) Holman Christian Standard Bible, (8) Reina Valera 1960, (9) New American Standard, and (10) New International Readers Version. 8. There are two general approaches to Bible translation, formal equivalence and functional equivalence. Formal equivalence seeks to reproduce the grammatical and syntactical form of the donor language as closely as possible in the receptor language, making only such changes as are necessary for intelligibility. Functional equivalence focuses on the meaning and attempts to accurately communicate the same meaning in the receptor language, even if doing so requires using different grammatical and syntactical forms. As Rodney J. Decker explains, all translations include both formal and functional equivalents and thus fall on a different part of the translation spectrum (e.g., KJV, and ESV are more formal while the New Living Translation is more functional). 9. All the books of the Old Testament except Esther, Ecclesiastes and the Song of Solomon are quoted or referenced in the New Testament. Jesus quoted or made references from Genesis, Exodus, Leviticus, Numbers, Deuteronomy, Psalms, Proverbs, 1 Kings, Isaiah, Jeremiah, Ezekiel, Daniel, Hosea, Amos, Jonah, Micah, Zechariah, and Malachi. Copyright © 2013 by the author listed above. Used by permission. The fate of the 2,700-year-old tomb and synagogue of the prophet Nahum in Al-Qosh, near Mosul, remains undetermined, as “it has become a football between Iraq, Kurdistan, UNESCO, IS and the Chaldean Christians.” The Jewish representative of the Kurdish Regional Government’s Ministry of Religious Affairs has appealed to UNESCO for support for the tomb’s preservation, as “it could completely fall apart in a few months,” as well as being a certain target for IS, but UNESCO responded that “the KRG is not a state” and that Nahum’s Tomb did not have World Heritage status. Some three years ago, a group of New York donors raised half a million dollars to restore the tomb, but “the money reportedly got lost in the transfer to a Mosul bank account.” Unless “a credible national or international authorization guarantees safe access,” the tomb’s fate appears extremely uncertain. 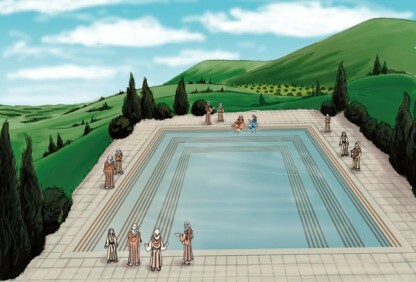 According to the Gospel of John, it was at the Siloam Pool where Jesus healed the blind man (John 9:1–11). UR, IRAQ The bleak and tawny desert of southern Iraq is a strange place to find dark tropical wood. Even stranger, this sliver of ebony—no longer than a little finger—came from distant India 4,000 years ago. Archaeologists recently found the small artifact deep in a trench among the ruins of what was the world’s first great cosmopolitan city, providing a rare glimpse into an era that marked the start of the global economy. 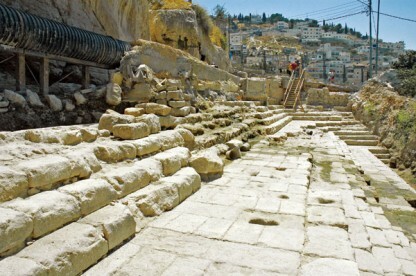 Mentioned in the Bible as the hometown of Abraham, Ur around 2000 B.C. was the center of a wealthy empire that drew traders from as far away as the Mediterranean Sea, 750 miles to the west, and the Indus civilization—called Meluhha by ancient Iraqis—some 1,500 miles to the east. Sir Leonard Woolley uncovered this lyre in one of Ur’s royal graves. 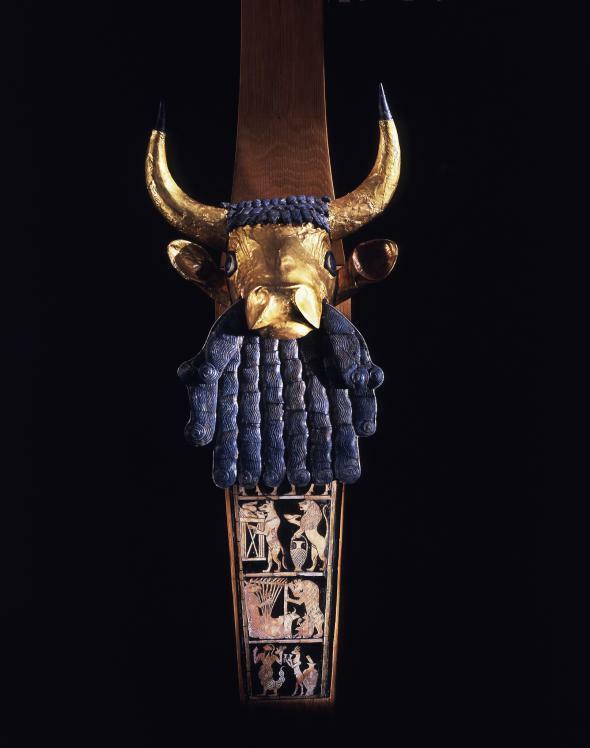 Dating to about 2600 B.C., this musical instrument features a bull with a beard of lapis lazuli—a stone brought from Afghanistan—that may represent the sun god. 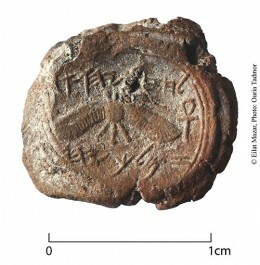 1st ever royal seal found in situ in Jerusalem; Ophel. Evidence of the Biblical Accuracy of the Account of the Exile. The relationship between archaeology and the Bible is not always an easy one, but sometimes they come together in striking agreement as witnesses to history. Two small clay bullae (seal impressions) found in the course of Eilat Mazar’s City of David, Jerusalem, excavations are bringing Jeremiah, prophet of the last kings of Judah, back to life. Read more. 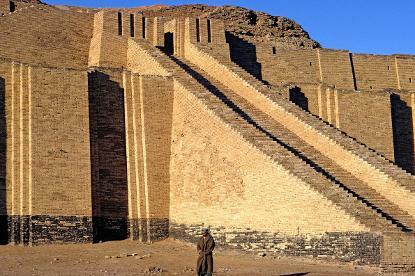 Article suggesting that drought may have played a hugh role in the demise of Ancient Sumerian Culture including its language. Article relating to the earthquake mentioned in Matthew 27:51-53. A Geological Study May Indicate Earthquake Described by Matthew. Read article here. The brutish, uncultured reputation of the Philistines might be upended by a discovery in the Israeli port city of Ashkelon..